An imperial cult is a form of state religion in which an emperor, or a dynasty of emperors (or rulers of another title), are worshipped as demigods or deities. "Cult" here is used to mean "worship", not in the modern pejorative sense. The cult may be one of personality in the case of a newly arisen Euhemerus figure or one of national identity (e.g., Egyptian Pharaoh, Ethiopian Empire or Empire of Japan) or supranational identity in the case of a multi-ethnic state (e.g., Imperial Era China, Roman Empire). A divine king is a monarch who is held in a special religious significance by his subjects, and serves as both head of state and a deity or head religious figure. This system of government combines theocracy with an absolute monarchy. 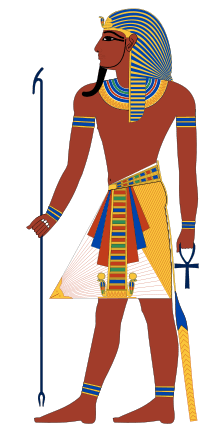 The Ancient Egyptian pharaohs were, throughout ancient Egyptian history, believed to be incarnations of the god Horus; thereby derived by being the son of Osiris, the afterlife deity, and Isis, goddess of marriage. The Ptolemaic dynasty based their own legitimacy in the eyes of their Greek subjects on their association with, and incorporation into, the cult of Alexander the Great. 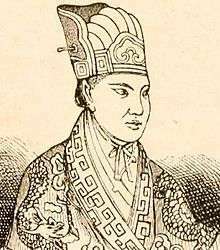 In Imperial China, an emperor was considered the Son of Heaven. The scion and representative of heaven on earth, he was the ruler of all under heaven, the bearer of the Mandate of Heaven, his commands considered sacred edicts. A number of legendary figures preceding the proper imperial era of China also hold the honorific title of emperor, such as the Yellow Emperor and the Jade Emperor. Caligula referred to himself as a god. Even before the rise of the Caesars, there are traces of a "regal spirituality" in Roman society. In earliest Roman times the king was a spiritual and patrician figure and ranked higher than the flamines (priestly order), while later on in history only a shadow of the primordial condition was left with the sacrificial rex sacrorum linked closely to the plebeian orders. King Numitor corresponds to the regal-sacred principle in early Roman history. Romulus, the legendary founder of Rome, was heroized into Quirinus, the "undefeated god", with whom the later Caesars identified and of whom they considered themselves incarnations. Varro spoke of the initiatory mystery and power of Roman regality (adytum et initia regis), inaccessible to the exoteric communality. In Plutarch's Phyrro, 19.5, the Greek ambassador declared amid the Roman Senate he felt instead like being in the midst of "a whole assembly of Kings". As the Roman Empire developed the Imperial cult gradually developed more formally and constituted the worship of the Roman emperor as a god. This practice began at the start of the Empire under Augustus, and became a prominent element of Roman religion. The cult spread over the whole Empire within a few decades, more strongly in the east than in the west. Emperor Diocletian further reinforced it when he demanded the proskynesis and adopted the adjective sacrum for all things pertaining to the imperial person. The deification of emperors was gradually abandoned after the emperor Constantine I started supporting Christianity. However, the concept of the imperial person as "sacred" carried over, in a Christianized form, into the Byzantine Empire. 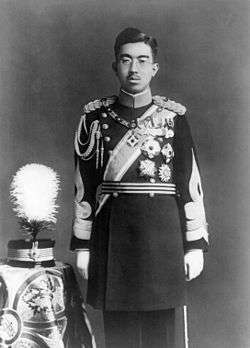 Emperor Hirohito was the last divine Emperor of Japan. In ancient Japan, it was customary for every clan to claim descendancy from gods (ujigami), and the royal family or clan tended to define their ancestor as the dominant, or most important kami of the time. Later in history, this was considered common practice by noble families, and the head members of the family, including that of the imperial family, were not seen to be divine. Rather than establish sovereignty by the manner of claimed godhood over the nation however, the Emperor of Japan and the imperial family stood as the bond between the heavens and the earth by claims of descending from the goddess Amaterasu, instead dealing in affairs related with the gods than any major secular political event, with few cases scattered about history. It was not until the Meiji period, that the Japanese Emperor began to be venerated along with a growing sense of nationalism. Arahitogami – the concept of a god who is a human being applied to the Shōwa Emperor (Emperor Hirohito as he was known in the Western World), up until the end of World War II. Ningen-sengen – the declaration with which the Shōwa Emperor, on New Year's Day 1946, (formally) declined claims of divinity, keeping with traditional family values as expressed in the Shinto religion. Devaraja is the Hindu-Buddhist cult of deified royalty in Southeast Asia. It is simply described as Southeast Asian concept of divine king. The concept viewed the monarch (king) as the living god, the incarnation of the supreme god, often attributed to Shiva or Vishnu, on earth. The concept is closely related to Indian concept of Chakravartin (universal monarch). In politics, it is viewed as the divine justification of a king's rule. The concept gained its elaborate manifestations in ancient Java and Cambodia, where monuments such as Prambanan and Angkor Wat were erected to celebrate the king's divine rule on earth. In the Medang kingdom, it was customary to erect a candi (temple) to honor the soul of a deceased king. The image inside the garbhagriha (inner sanctum) of the temple often portrayed the king as a god, since the soul was thought to be united with the god referred to, in svargaloka. It is suggested that the cult was the fusion of Hinduism with native Austronesian ancestor worship. In Java, the tradition of the divine king extended to the Kediri, Singhasari and Majapahit kingdoms in the 15th century. The tradition of public reverence to the King of Cambodia and King of Thailand is the continuation of this ancient devaraja cult. The Susuhunan of Surakarta and Sultan of Yogyakarta are the direct descendants of the Mataram Sultanate founded in the late 17th century, and was said to be the continuation of the Ancient 8th century Mataram kingdom. Tibetan Buddhism uses the tulku system, an ancient way of finding the reincarnation of a previous deceased lama: they are usually young boys, sometimes of wealthy and influential families and sometimes of peasant families like the current 14th Dalai Lama, that are found and enthroned as the reincarnation of an enlightened person that has already deceased. Every tulku are still called on the title of Rinpoche and is given as much respect as his previous reincarnation. Complying with each and every wish of a child- or adult tulku is not unusual. Tulkus lead responsible lives because of their status as a bodhisattva. While many tulkus are monks, some tulkus choose to lead lay lives with families of their own. Haile Selassie I of Ethiopia was an Ethiopian Orthodox Christian, and did not consider himself divine, but the Rastafari movement in Jamaica saw him as the second coming of Christ. ↑ Sengupta, Arputha Rani (Ed.) (2005). "God and King: The Devaraja Cult in South Asian Art & Architecture". ISBN 8189233262. Retrieved 14 September 2012. ↑ Sharer & Traxler 2006, p.183. Sharer, Robert J.; Loa P. Traxler (2006). The Ancient Maya (6th (fully revised) ed.). Stanford, CA: Stanford University Press. ISBN 0-8047-4817-9. OCLC 57577446. Ameresekere, H. E. (July 1931). "The Kataragama God: Shrines and Legends". Ceylon Literary Register. Kataragama.org. pp. 289–292. Archived from the original on January 12, 2016. Retrieved 20 April 2016. Baptist, Maria (Spring 1997). "The Rastafari". Buried Cities and Lost Tribes. Mesa Community College. Archived from the original on June 5, 2008. Retrieved 20 April 2016. Effland, Richard (Spring 1997). "Definition of Divine kingship". Buried Cities and Lost Tribes. Mesa Community College. Archived from the original on June 5, 2008. Retrieved 20 April 2016. Effland, Richard; Lerner, Shereen (Spring 1997). "The World of God Kings". Buried Cities and Lost Tribes. Mesa Community College. Archived from the original on July 5, 2008. Retrieved 20 April 2016. Marglin, F. A. (1989). Wives of the God-King: The Rituals of the Devadasis of Puri. New Delhi: Oxford University Press. ISBN 0-19-561731-2.